EcoReco M3 Electric Scooter—Tool or Toy? Having fun in the California sun is just one of the ways the M3 can serve you (or me in this case). 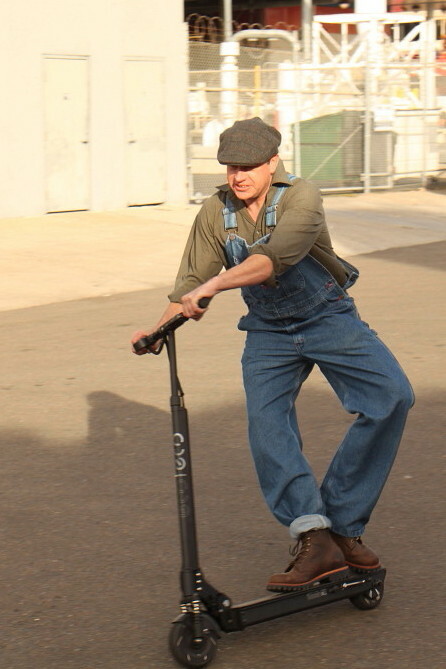 I’m sure electric scooters have been around for quite a long time. Ever since EcoReco approached me to try out their new M3, I’ve thought back to different ones I’ve seen and people I know who have them. What seems different about this one is the level of sophistication and performance it has. The fit and finish match the power and range in the best of ways. In addition to giving you knowledge about it and my impressions, I intend to answer the question raised in my title. Although a electric scooter might not be on your list of needed items, you might consider thinking about what it can do for you. Smooth and solid, fast and far, different and noticeable, the EcoReco M3 can cover a wide range of personal fulfillment. The M3 comes fully assembled and is packed in a cool carry box. This scooter really moves out. It tops out at 20 mph on level ground, maybe faster than you really need. It is quite a rush to power down and let the brushless motor wind up to full revs. I told myself before I got it that I would pop on my helmet if I was going to go full speed, but I never wore it once. The M3 gives you lots of confidence, but keep in mind the small tires could catch on minor road irregularities easier than a bike. The tires are solid (no flats) and grip better than you might think. 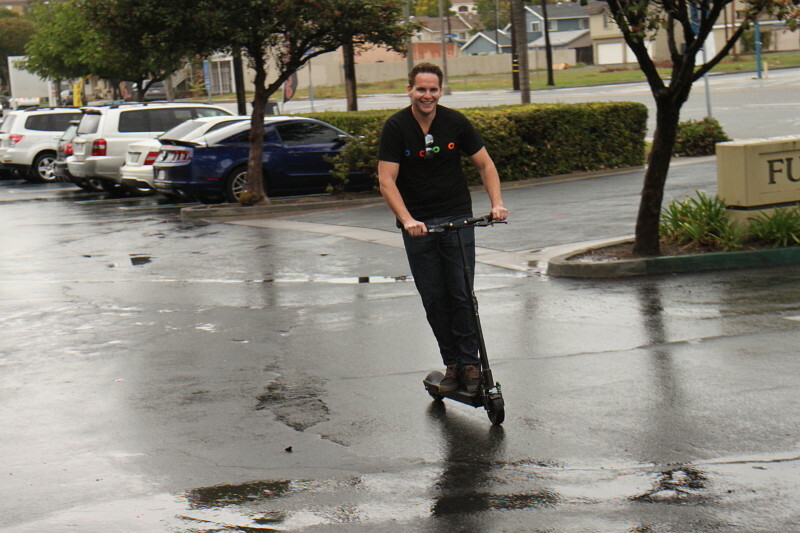 I brought it to a 2014 E-bike demo event in Orange County on a rainy day and a bunch of people tried it out during the drier moments. The slick wet parking lot allowed for some exciting fun and sliding about. We drifted it through the corners and I pulled off a ton of classy donuts in front of the store. We splashed through the puddles and generally went kind of wild. Colby puts the M3 through its paces on the rain slickened parking lot. On the dry the tires grip fine. Plying smooth roads on the M3 is like a magic carpet ride, floating on air. As the pavement gets rougher you can feel the vibes and the real rough stuff does make you wish you had pneumatic tires under the deck. It has a front suspension, but this is no dirt bike. You can hear a little rattling from the front end on rough surfaces due to some minor slop in the steering pivot, yet it never caused me any concern. Made from sturdy aluminum, on the whole I was very pleased with its rigidity. At 34 lbs, it is pretty hefty, but considering the power of the motor and the size of the lithium battery, it is a true lightweight. I tucked it in and out of the my trunk easily so many times and it balances nicely when you carry it folded. I’m not sure if the optional carry bag comes with a shoulder strap, if it does it would make for a better way to move it about when you are not riding. Folding is so easy, push down the locking latch lever, release the main latch and the bars fold down flat. The two handlebar extensions fold down like periscope handles on a submarine. You can also collapse the upright bar about a foot for a smaller package. This part also allows you to adjust the EcoReco M3 for different height riders. The undercarriage is sealed and sleek, and it has a plastic bumper to protect it and the floor when you set it down folded. I was glad the see the fenders, and the kickstand was a treat to use. You just cruise to a stop, flip down the kickstand and the M3 stands at the ready for the next ride. Petteri said it was scary, yet his smile says otherwise. I took the M3 to several group bike rides and one of my E-bike presentations. Many, many riders took it for a spin and in each case it seemed a big smile was the main result. There was always much conversation about how it could make the shorter trips easy, and how much fun it is. Although one rider commented it was the scariest thing he had ridden all year, I noticed he was smiling the whole time and he took it for a longer ride than most. I even let a 7 or 8 year old girl ride it (check the video link below). She and her sister approached me when they saw everyone else hopping aboard to ask if they could ride it too. After talking to their dad, and making sure he was right there, first the older sister took a spin and then she took to the throttle. They both took it easy and stayed close, but enjoyed it immensely, with a big smile of thanks for me after. I was a little apprehensive, but had ridden it enough to feel confident they would be ok. The EcoReco M3 has a single brake lever that connects to the rear drum brake. It seemed plenty strong to me, yet a couple people mentioned it would be nice if it slowed the scooter quicker. The power control is very simple. A small lever at your right hand gives proportional control of the motor’s power. Very smooth action from the throttle results in the same from the motor. The safety programming of the scooter keeps the motor from coming on at a stop, it will only start when the scooter is moving. At one of my E-bike presentations at a local Kiwanis Club, the EcoReco M3 was right at home with these top-end E-bikes. Included is a nifty handlebar mounted display unit. Not only is it back lit, it reads out your speed and other things like a trip odometer. It also tells total miles ridden and battery cycles. The battery is good for over a 20 mile range, but hill climbing, heavy riders, higher speeds and lots of stops and starts will reduce it to maybe half that. 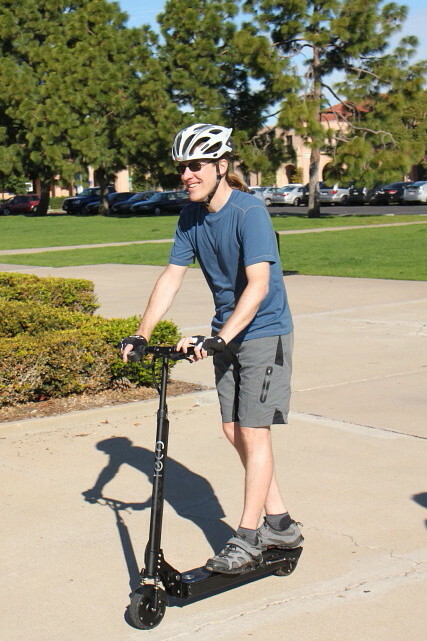 Don’t expect it to climb grades like a high-end E-bike, yet it is way better than walking. The M3 is touted as last-mile transportation. When I go downtown I try to always park in the available and free areas on the fringes and ride my bike the rest of the way. Perfect use for this electric scooter. When I take my electric bike on the local trolley it can be kind of tough getting it up the steps on the older ones. Once again, M3 to the rescue. 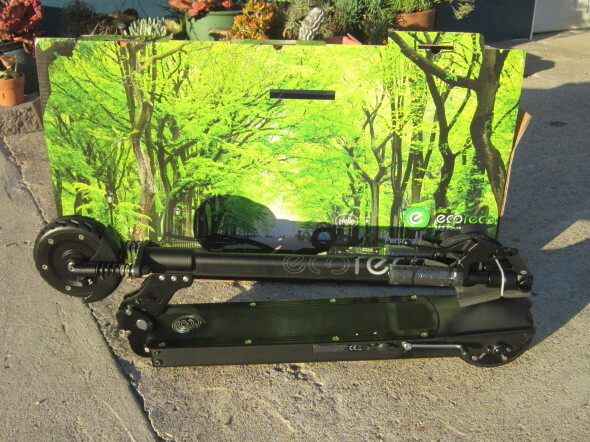 Sometimes in my neighborhood I’ll walk, not with the EcoReco scooter, zip and I’m there. I rarely take my bike on the bus, but I hear they won’t take E-bikes, and if there are already two bikes on the front carrier you have to wait for the next bus. Not with the M3. This guy was really making the M3 talk to him. I think he wants one now (and he isn’t the only one that felt that way after a test hop). Then again the fun factor is huge. Trucking around with power, zigzagging about, feeling the rush of acceleration each time you pull the throttle, these are the thrills I experienced. The looks drawn as you pass don’t mean much to me, yet I could see many do a double-take as I motored by. That’s fun too. So the story is that the EcoReco M3 covers both the serious tool and big fun arena. It has great features, a strong build, and appears to be good for the long haul. I don’t know much about Kickstarter, yet it appears that you can use it to save a bundle if you move quickly. And that’s just the way you’ll be moving on your new EcoReco M3. 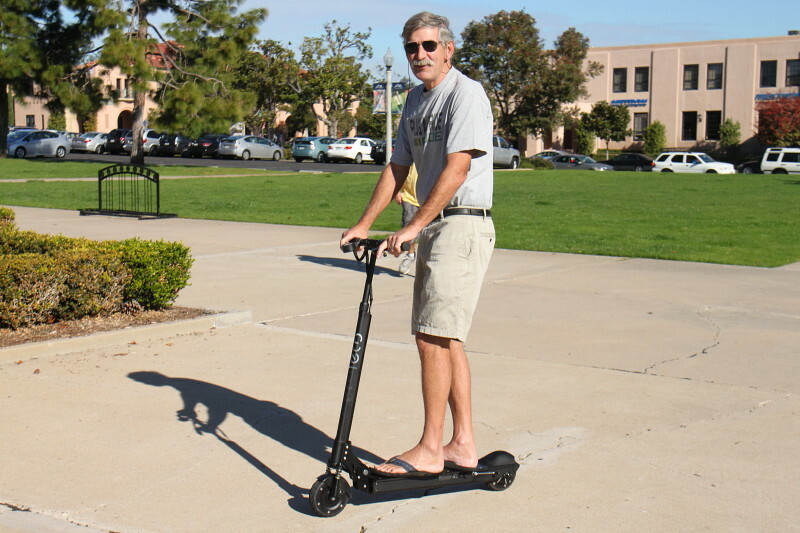 I’ve been scooting, how about you? Turbo Bob. “Cyclers see considerable more of this beautiful world than any other class of citizens. A good bicycle, well applied, will cure most ills this flesh is heir to.”—Dr. K. K. Doty. 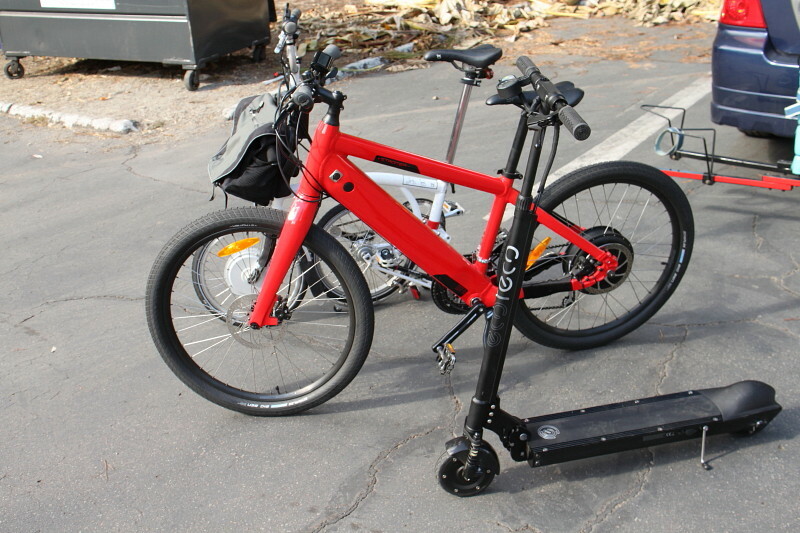 This entry was posted in E-bike general interest, E-bike test reviews. Bookmark the permalink. 5 Responses to EcoReco M3 Electric Scooter—Tool or Toy? Thanks, Turbo. It is a great in depth article. I am really glad you like and recommend the scooter to everyone. There are still areas that we at EcoReco need to improve, and we appreciate you for honest feedbacks. Great review, Bob. It looks like a great scooter. Much advanced from the electric scooters of 5 years ago. I’m hoping that when the EcoReco M5 comes out, that will solve for my only remaining concerns. The M5 will have a rear suspension, and hopefully it will also have pneumatic tires either standard or as an option. The M3 appears to be very well-built, but I worry about the battery being jarred around without a little more cushioning (as would be provided with a rear suspension and air-filled tires). LiFePO4 batteries are pretty durable, but still, they shouldn’t be subject to any more vibration than is absolutely necessary. In fairness to EcoReco, I haven’t heard of even a single problem with the batteries. But then, the scooter hasn’t been out that long either. I’d want to see a large sampling of scooters with 12+ months on them to know if this is a legitimate concern, or just my own paranoia. One other cool note about the M3: I calculated that if I ran most of my local errands (under 5 miles) on this scooter instead of taking my car, the scooter would entirely pay for itself in about 18 months. Not to mention the fun factor of simply riding it. Although intangible, sometimes that’s payment enough! I’ve watched a lot of videos from Asia, young men riding gas powered, full sized scooters. They are absolutely fearless. Maybe that’s a good thing, when you are young at least, to be fearless. To me the lesson is that batteries change everything. We’ve had the motors, but never the high energy dense, relatively cheap batteries. There have to be other possibilities than adding these components to a bike. You seem to review a lot of the less expensive bikes. It seems like that is where the industry will have to develop. Those bikes by Mahindra seem genuinely interesting. And so does this scooter. Thanks!